The Auchentoshan Distillery is located just outside the centre of Glasgow, and is one of very few lowland distilleries still in production. Situated on the north side of the River Clyde, it’s a quick ten minute drive from Glasgow International Airport. As I discovered on my tour, Auchentoshan means “corner of the field”, as the distillery literally sits in the corner of a field. To reach Glasgow, I had a two hour drive north from Carlisle up the M6 and A74 in the most miserable of weather conditions. At one point the rain was so heavy, and the reduction of my visibility was so severe had the car in front of me not been bright yellow, I would have had to pull over, assuming I was able to find the shoulder. 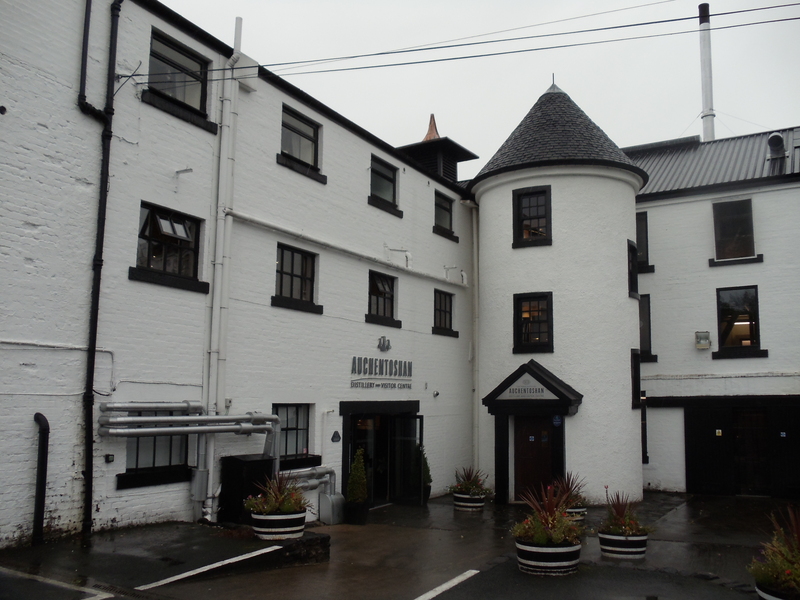 Even though the weather was certainly not cooperating, I was still looking forward to my afternoon at Auchentoshan. Upon reaching the visitors centre, I was greeted by a very friendly member of staff and I booked to take the next available tour. Prior to the tour beginning I was shown a small ten minute film on the history of Auchentoshan, and was offered tea or coffee along with a piece of authentic Scottish shortbread. By the time the film came to an end, there were a number of others waiting for the tour to begin, and away we went. Much like every tour that I have taken, we were led from the mash tuns, to the washbacks and eventually to the still house, but once we arrived at the still house we were shown the one thing that separates Auchentoshan from every other Scotch distillery. Traditionally, when whisky is distilled in Scotland, it passed through two stills, much like giant kettles. First the liquid is boiled in the wash still, the larger of the pair, and then distilled a second time in the spirit still. Each time the liquid boils inside, it passes through the neck and collects in a massive drum where it comes into contact with copper pipes full of cold water. Once the steam from the still makes contact with the cold pipes it turns back into a liquid, and it’s this liquid that is put into casks and aged eventually becoming whisky. At Auchentoshan they distill their whisky three times in three separate stills, one wash, and two spirit, something that is rarely seen outside the production of Irish whiskey. The result is a much mellower and light bodied whisky, which will take a greater influence from the casks in which it’s stored. Now came for the part of the tour where the group was to make our way across the grounds to one of the original warehouses. Did I mention it was raining? It was still raining very heavily, so our tour guide took it upon herself to hand out some umbrellas specifically reserved for visitors. By the time we reached the entrance to the warehouse (roughly 100 yards away), everyone on the tour was wet, very wet, and each of the umbrellas were now inside-out and useless. We spent a good ten minutes in warehouse learning about the different types of casks, their sizes, and the types of wood used. By the time our tour was ready to head for the tasting room, it was just our luck that it had stopped raining long enough for us to make back into the main building. Our tour concluded with a dram of Auchentoshan 12 Year Old and a dram of Auchentoshan Three Wood. I must say, the 12 Year Old was an instant favourite. It was so smooth, and its beautiful ruby hue was a hallmark of the sherry barrels used in the aging process. Afterwards, I had a quick browse through the gift shop and picked up a jar of marmalade made with whisky from Auchentoshan, and a small set of bottles that is known as the Stillman’s Collection. In three 50mL bottles, there are samples of new make spirit at three different ages. The first was the day it was placed in the cask, the second was one year later, and the final was two years after being placed in the cask. It is amazing to see how much the spirit changes color in the first year, and how much more again in the second year. I picked it up as neat souvenir, but it has come in handy when I have been attempting to describe the whole maturation process. 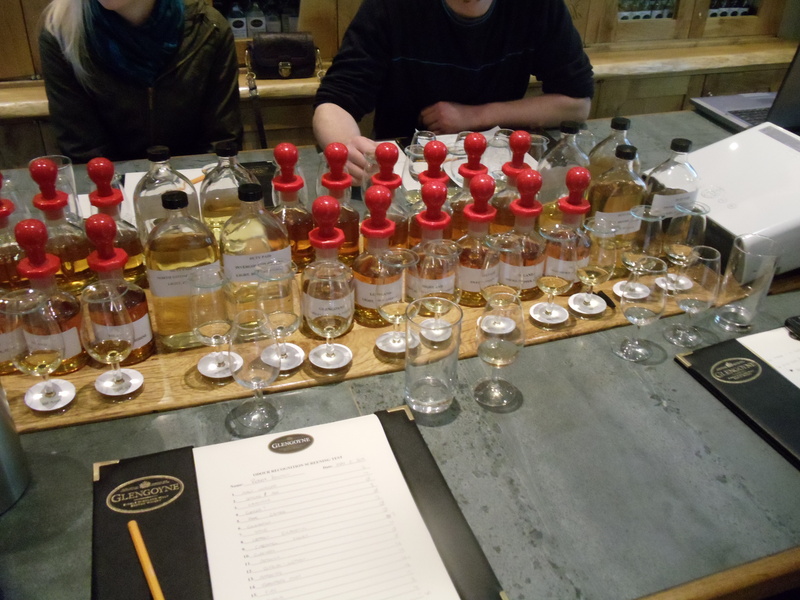 Putting the weather aside, I really enjoyed my day at Auchentoshan. I was touring another Scotch distillery and was able to sample some of their wares, and picked up a couple neat gifts along the way. For any whisky enthusiasts visiting the Glasgow area, you need to take the time and head to Auchentoshan. Another excellent tour with a most hospitable staff, I couldn’t ask for anything else, except maybe a stronger umbrella. My second tour of a Single Malt distillery was at Glengoyne, which sits roughly 16 miles north of Glasgow, Scotland. Having thoroughly enjoyed my tour at Highland Park, I made the effort to take part in another tour on my next visit to the UK. 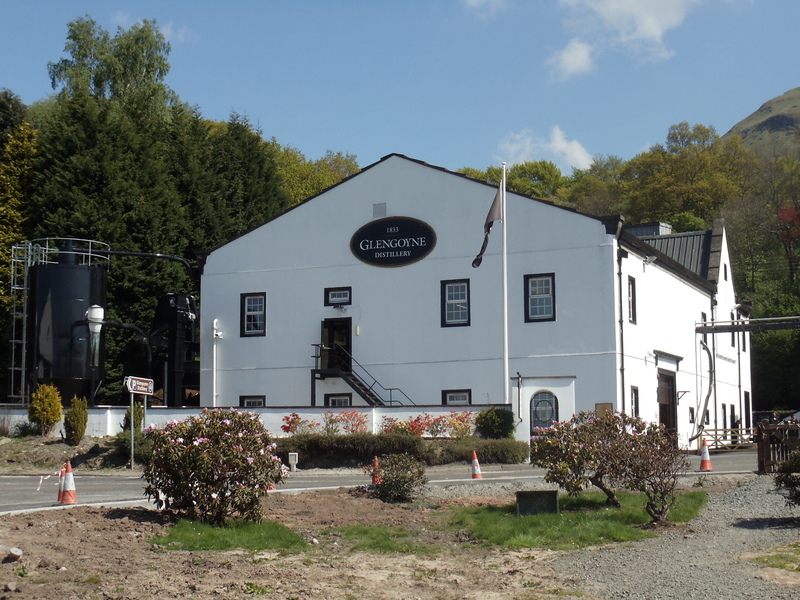 I made enquiries at numerous distilleries, and made my decision to visit Glengoyne based on their Master Class tour. The Master Class tour has won numerous awards for having the most in-depth distillery tour, and I certainly wasn’t disappointed. Lasting over 4 hours, the Master Class tour begins in what was once the residence of the master blender. It begins with a casual conversation with the tour guide and a tasting of Glengoyne 17 Year Old. After an introduction to the other patrons on the tour, we were led into the distillery for the traditional distillery tour. As with any tour, we followed the process for making whisky, starting at the mill, making our way through the washbacks and mashtuns, and finishing in the still house. It was at this point, we learned of a very interesting characteristic of the distillery. For those of you who do not know, there are four major whisky producing regions in Scotland: Lowland, Highland, Speyside and Islay. Glengoyne has the distinction of being a Highland whisky, yet their whisky matures in warehouses across the road, on the other side of the whisky line, making it Lowland territory. As for the warehouses, this was the first time I was able to see how mass production and modern influences affected the distillation of whisky. Typically on a tour, you are taken to one of the original stone warehouse where the casks sit on racks, as was the process for many years. Now, with scotch whisky being sold throughout the world, distilleries need larger warehouses to house their casks. By the time of my visit, Glengoyne had established new warehouses, which were much more modern than the old stone warehouses for which distilleries are famous. In the these warehouses, stacked eight high, were pallets of casks sitting on their end and packed from wall to wall. 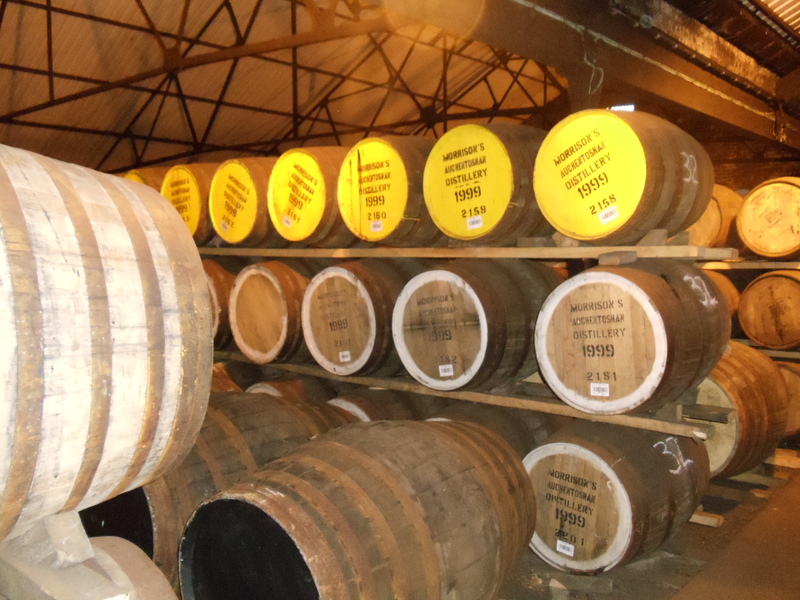 In these casks was whisky that was more than likely to be sold for blended whisky as opposed to being used for Glengoyne Single Malt. It was intriguing to see the scale of the operation, and to see what type of changes the scotch whisky industry was undertaking to continue to supply the increasing demand around the world. After returning from our tour of the distillery, we were provided with lunch consisting of sandwiches and home-made pastries. Now for the rest of the Master Class. It began with a very in-depth tutorial on how to identify the types of scents found in whisky. We were given twenty different jars containing common scents found in whisky, and we filled out a little quiz as we identified each scent. Some scents such as smoke, peppermint, and anise were easily identifiable, but there were some that I never would have guessed, especially the eucalyptus. But all this training lead to the final task of the day, blending our own whisky to take home. In this picture you can see six bottles with red tops, and two larger bottles with little black caps. The bottles with the blacks caps contained grain whiskies, which would be the base for our blend. In those bottles with the red lids, we had six malt whiskies. One Highland, one Lowland, one Speyside, one Islay, one from the Islands (which is a smaller region of the Highlands) and one from right here at Glengoyne. These whiskies would be the ones that add flavour and character to our whisky. We were given a sheet, and had to document the measures of each whisky we used to create our final blend. It was a challenge to sit there and think about the flavour profile I wanted from my whisky, but after forty minutes of blending and nosing, my whisky was complete. After being blended, we had to name our whisky – I named my bottle Highland Crown – and we handed our recipes back to Glengoyne, so should we ever wish to purchase another bottle, they had our exact blend on file. One of the other members of the tour named his “Last Resort”, so I think that shows what confidence he has in his blending skills. And that was the end of another amazing tour. I gained such a greater depth of knowledge about the whisky industry itself, not to mention the detail involved in the craftsmanship, I have been able to have a better appreciation for the tours I have since taken. I have yet to try my bottle of “Highland Crown” to see how it stands up against other whiskies, but I think I might let it sit for now, and leave the whisky making to the experts.